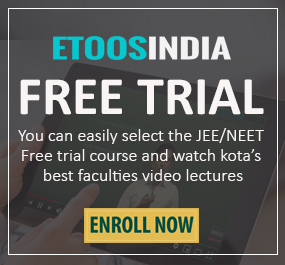 How to Avoid Mistakes During the JEE Exam Preparation? 1) Too many reference books equal a perplexed mind: While preparing for JEE, students often end up buying numerous reference books spending thousands of rupees. They tend to study from these reference books and other study material that is provided by their coaching institutes. In this battle to find the right study material, they often forget that NCERT should be their ultimate choice to start their preparation with. Reference books should only be looked up to once your NCERT book finishes. Buying a plethora of reference books will only burn a hole in their pocket and leave your mind baffling. Rather it is suggested to choose the right quality & number of reference books and use them only when the need arises. 2) Ignoring NCERT can be a cardinal sin: Books by NCERT should be the first choice for all candidates who are aspiring for IIT-JEE. Students should focus on clearing concepts rather than memorizing them. JEE, as we all are aware, is an analytical paper which tests your understanding of concepts in subjects Physics, Chemistry and Mathematics. So, it is advised do not overlook NCERT topics as they are extremely crucial. Refrain from mugging up concepts. 3.) 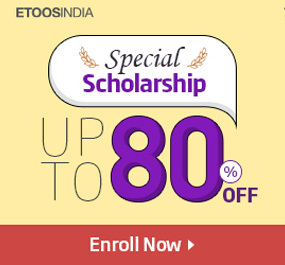 Leaving important topics for last minute will be mind-boggling: Every year the exam conducting authority issues guidelines and syllabus for JEE along with weightage of different topics. All aspirants should analyse the syllabus closely and be thorough with the important topics. Do not leave them for last minute preparation as this can be quite an arduous task. It will confuse your mind and at the end of the day create stress. So, we advise preparing a full-fledged strategy in order to complete the important topics beforehand. 4.) Taking class XI lightly can cost you big: A lot of people pay no attention to class XI syllabus. They might pay a heavy price for this at later stages if they do so. Class XI syllabus lays the foundation for class XII. If your base is weak, there are high chances you won’t get the topics of XII subjects with that ease. So, the conclusion is to take class XI syllabus seriously. 5.) Comparing your progress can be detrimental: Aspirants preparing for entrance tests have a habit of competing with other fellow candidates. But what you need to understand is that everyone has a different pace of learning and grasping concepts. One should not at any cost compare their progress or failure with other students. 6.) Over-confidence or under-confidence can ruin your prep: A fine line separates confidence, over-confidence & under-confidence. Students have to make sure they aren’t over-confident about their preparation as it might result in underestimating your competitors. Becoming under-confident will lose motivation. Hence, just be confident and keep practising at your own pace. 7.) Do not overlook your physical & mental health: Keep reminding yourself of the famous proverb ‘Health is wealth’. Studying is important for JEE but being healthy both physically & mentally is even more important. Regular exercise, intake of fresh fruits & vegetables, avoiding junk and processed foods will be beneficial for health. Take recreational breaks in between; relax a bit by playing your favourite music or reading your favourite book, etc. 8.) Backlogs are a burden: While preparing for JEE, make it a point not to create backlogs. Be it solving daily practise sample question papers, question banks or finishing a chapter; make sure you finish the task the day it is given. The greater the backlogs, more hard work and time will be invested to clear it. 9.) Attempting questions with negative marking: You must have surely heard of the negative marking in JEE paper. If you think attempting all questions will win you the battle then you’re wrong. If you aren’t sure of a question, do not attempt it. A lot of students mark all the answers trying their luck. In this way, both the scores as well as results are affected. So, it is advisable not to attempt all questions unless you’re very sure. 10.) Giving up: The preparation for IIT-JEE can be tiresome. Your schedule generally is study, eat, sleep, and repeat. This can often dull your mood and lose your focus. All you require is self-motivation every day in order to keep going. 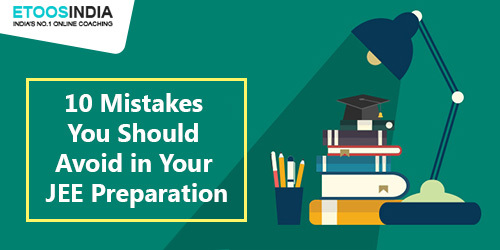 So, pull up your socks and avoid these little mistakes while preparing for JEE. All the best!